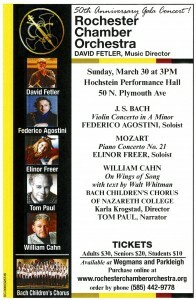 I am very excited that one of my compositions is programmed on the Sunday, March 30, 2014 concert of the Rochester Chamber Orchestra under the direction of David Fetler at the Hochstein School of Music. The Bach Children’s Chorus of Nazareth College will join the RCO in a performance of On Wings of Song with text by Walt Whitman narrated by Tom Paul. On Wings of Song is a suite of four traditional songs about birds – “The Birds’ Courting Song,” “The Birds In the Spring,,” “The Cuckoo,” and “Rise, Rise, Thou Merry Lark.” Each of the songs is preceded by prose of the great American poet, Walt Whitman, whose words reveal his observations on birds and nature. The prose and songs are framed in my own original music. The concert will celebrate David Fetler’s 50-years with the Rochester Chamber Orchestra. or by calling (585) 734-6163.